The hair of each person differs. It differs based on the food they eat, climatic conditions, sedentary lifestyle and the way they care for their hair. The differences can be noted in means of color, quantity, lustre and growth rate. Everybody wishes to grow a hair which is thick. For some it is naturally thick while others do not have thick hair. Every person on this planet has experienced hair loss once in their lifetime. There are many reasons for hair fall. They can be diagnosed. The diagnosis should not be of chemicals that adversely affect the hair and result in further damage to hair. Instead it has to be natural providing a multifold range of benefits like prevention from fungal attacks, reducing split ends, stop receding hairlines and prevent dandruff. The natural methods are cheaper while the artificial ones cause harm. Getting thick hair is not so difficult but the real challenge lies in maintaining it no matter what under all circumstances. Aloe vera is also known as miracle plant. 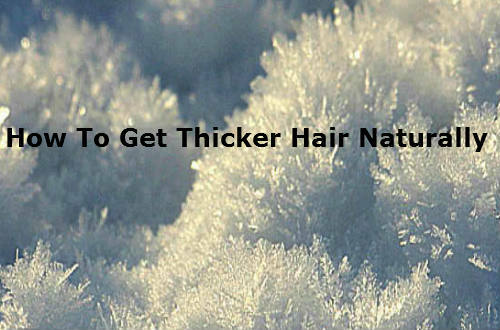 It is rich in vital nutrients that make the hair grow thicker. Besides it also provides numerous other benefits. First we have to take two or three aloe vera leaves and cut them into two to collect the gel. Apply the gel on the scalp and let it rest for some time. Rinse the hair thoroughly. Another mixture is made by mixing aloe vera gel with a small quantity of brandy and egg. We must leave it on the scalp for about half an hour and with a mild shampoo the hair must be rinsed to let go off the smell of the egg. Repeating this procedure thrice a week can help in maintaining a thick and glossy hair. Orange is one of the fruits that is rich in citric acid. The citric acid helps in promoting hair growth. The orange peels are made into a pulp which is applied on the scalp. After letting it remain on the head for a time of fifteen minutes we may then rinse the hair. Another mixture is prepared by mixing apple and orange juice or by mixing orange juice and olive oil. In either case, the mixture when applied on the head is allowed to remain on the head for about twenty minutes. Then the hair is then washed with a mild shampoo to have a glossy and smooth hair. Egg is inevitable when it comes to providing essential nutrients to the hair. Egg has all the essential nutrients that are enough to sustain the natural properties of the hair as it is. The procedure for applying egg paste on the head is by breaking two eggs and blending them together. We may then apply it on our wet scalp by adding a little water. Rinsing it with a mild shampoo may help to relieve from the smell of the egg. Coconut oil can also be mixed with egg to apply it on the head. Repeating this for about thrice a week helps in attaining thick hair. It is a natural ingredient that helps to attain natural and healthy hair. Avocado are mashed with banana and massaged on the scalp after adding some water to the paste. It is allowed to remain so for about half an hour so that all the nutrients get inside the scalp. After twenty minutes the hair may be rinsed with a mild shampoo to see the glossy hair formed. Natural ingredient to vitalize hair can be made by smashing avocado and adding a little olive oil to it. Similarly this is let to remain on the head for about half an hour and then washed with plain water. Fenugreek seeds are a natural and an easy homemade remedy for healthy and thick hair. Fenugreek seeds are soaked in water for a period of ten hours. It is better to soak them at night so that we can use it in the morning. The seeds are separated from the water and made into a paste by adding a little more water. The paste is applied on wet hair and is allowed to remain for about twenty hours. The hair is then washed with plain water. The water in which we soaked the seeds can be used to wash the hair. It cleanses the hair of dandruff and other infections. Amla is rich in exfoliating properties that are necessary for hair growth. Finely powdered amla powder is then boiled in coconut oil or water. After it has been allowed to cool, it is filtered and the strained oil is massaged on the scalp. Always put a cover on the head so that the oil will not stick to the pillow. In the morning rinse your head with a mild shampoo. Try to wash your hair with the water with which you soaked the amla atr night for quicker desired effects. Coconut oil is used since time immemorial for the treatment of hair related problems. It is used extensively in Asian countries. It enhances hair growth. Boil a little of coconut oil and allow it to cool. Massage it on the head using the tip of the fingers without exerting much pressure. Leave it for about twenty minutes. Then rinse the hair with mild shampoo. Repeat this thrice a week for healthy and strong hair growth. Omega 3 fatty acids are present in olive oil which promotes hair growth and stops hair fall. Apply olive oil to your head before going to bath using the tips of the fingers. Let it remain on the head for about quarter of an hour. Then wash it off with mild shampoo. Repeat this thrice a week for better results. Mixing olive oil and honey to apply on our scalp results in strong and soft hair. Linseeds are also known as flax seeds. It helps to increase the hair growth. The seeds should be soaked in water for about five days. It is then taken and made into a paste. Cotton buds are used to apply it on the hair. It is then washed after fifteen minutes. Daily intake of linseeds can result in glossy hair over a period of time. These leaves are used from ancient times for coloring hair and for other health related factors. This involves grinding the leaves into a paste with a little amount of water. It is massaged on the scalp and left to remain for about twenty minutes. It is then washed with lukewarm water. Effective hair growth can also be made by mixing egg with henna and washing off with warm water. Repeating this at least four times a week can result in a healthy hair.